For its third year, TennoCon is happening this July: it’s a convention for fans of Warframe, and it will take place on Saturday, July 7, in London, Ontario (did you know Canada had a London too? I definitely didn’t). Tickets go on sale this Wednesday, February 28, with a Digital Pack for those who can’t attend following, on April 3. 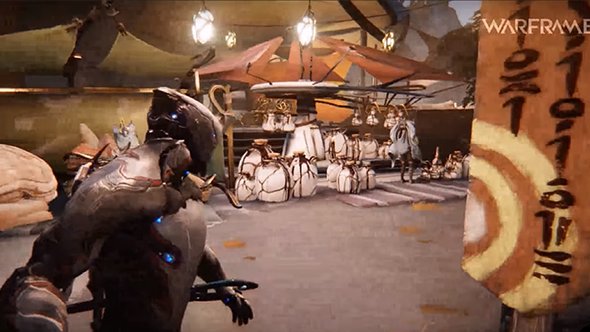 Did you hear, Warframe is getting a new open world hub? It’s on Venus, you can click through for the first look at it. Full Day Ticket – $30 CAD – includes full-day access to the conference and Swag Bag, plus digital Glyph, Sigil, Cosmetic (Armor Set), 370 Platinum, Digital Art Piece, and exclusive access to Baro Ki’Teer in the TennoCon Relay. Collector’s Ticket – $75 CAD – includes full-day access to the conference, Swag Bag, and Collectors’ T-shirt, plus digital Glyph, Sigil, Cosmetic (Armor Set), 1,000 Platinum, Digital Art Piece, and exclusive access to Baro Ki’Teer in the TennoCon Relay. Limited VIP Ticket – $250 CAD – includes full-day access to the conference, Swag Bag, Collectors’ T-shirt, VIP Brunch at Digital Extremes, Early Access to TennoCon, and a Collector’s Statue (choose from Valkyr, Nyx, Rhino, Mag), plus digital Glyph, Sigil, Cosmetic (Armor Set), 1,000 Platinum, Digital Art Piece, and exclusive access to Baro Ki’Teer in the TennoCon Relay. Limited Legendary Ticket – $1,000 CAD – includes full-day access to the conference, Swag Bag, Collectors’ T-shirt, VIP Brunch at Digital Extremes, Early Access to TennoCon, a Collector’s Statue (choose from Valkyr, Nyx, Rhino, Mag), 4x TennoCon T-shirt mega-pack, NPC Voice Recording Session (Voice a Relay NPC! ), DevStream Team Session (Ask your own questions for a 15-minute personal Devstream! ), Custom Personal Glyph (We’ll design a Glyph with you that’s yours), plus digital Glyph, Sigil, Cosmetic (Armor Set), 1,000 Platinum, Digital Art Piece, and exclusive access to the Baro Ki’Teer in the TennoCon Relay. The Digital Pack can be thought of as similar to Blizzard Virtual Tickets, albeit without streams being locked away for those who don’t pay. The Digital Pack costs $20 USD, and includesTennoCon digital Glyph, Sigil, Cosmetic (Armor Set), 370 Platinum, Digital Art Piece, and exclusive access to Baro Ki’Teer in the TennoCon Relay – that’s everything from the Full Day Ticket, bar the swag bag and access to the physical event itself. A portion of ticket sales will go to the official partner of the event, Canada Learning Code, an education organisation who teach programming and more to women, girls, people with disabilities, Canada’s indigenous population, and newcomers to code. Tickets will be available from 11:00 PST/14:00 EST/19:00 GMT/20:00 CET on the official TennoCon website on February 28.